It’s almost high noon at Five Oaks Ranch. The grazing horses lift their heads and amble over to meet sheriff Gerry Mannion as he approaches the corral. They can tell from the bunch of strangers present that it’s time to get saddled up again. The Sheriff helps some of the riders into their saddles and adjusts the leather stirrups. Then he mounts his own horse, tips his hat to the back of his head and sorts the riders into line, tucking rookies in behind his horse so he can keep a weather-eye on them. He raises his hand, and we move out in single file at a sedate pace. Dang, it’s good to be on horseback again, and in the Wild West – even if it’s the wild northwest of Ireland and not Wyoming. In fact, it’s darn hard to believe that we’re not in the Wild West, because the horses we are riding are pure-bred American Quarter Horses. Our saddles are American stock saddles (the same model used by cowboys in the Wild West) and we’re even using American–style split reins. Behind us on the Mannion ranch is a Western town with a sheriff’s office, jail, a general store and a saloon complete with cactus plants outside and mounted steers heads on the wall. It feels like being on the movie set of “A Fistful of Dollars," and it certainly helps create the right atmosphere. Five Oaks Ranch lies deep in the beautiful Knather Woods outside Ballyshannon in south Donegal. It’s the creation of Gerry and Jackie Mannion, a husband and wife team who fell in love with quarter horses and the western style of riding while visiting the USA, and decided to bring it both home to Ireland. Since they opened their ranch to the public in 1998, it’s become hugely popular with top-notch riders and novices alike. The very reasonable rates here (20 euros for a trail ride) make the experience accessible to local people, from tots right up to seasoned riders. The Mannions are on a real mission to popularize Quarter Horse riding in Ireland. Irish people are their main customers, but they also attract visitors from all over Europe, American and Canada. As I begin to climb aboard my American steed, I realize this will be a very different experience from the riding lessons I took as a youngster in Dublin. For a start, you hold both reins in one hand only, as opposed to the method I’m better acquainted with, using two hands. Then you have to change the way you sit, because the western saddle is broader than the regular European type – it’s designed to literally give you a laid-back seat. Happily, the horses are so intensively trained and react so well to the touch that you don’t have to exert much pressure to control them. They suit riders of all abilities, from first-timers to show-jumping pros. Pecos, the handsome 12 year-old I’m riding, is such a smart hoss that she assesses my riding ability in a nanosecond. She politely resigns herself to having a rusty amateur on board. She keeps a steady pace throughout the trail, which boosts my confidence. That’s good, because most of the other riders out today are pretty experienced. Aisling and Julia (the latter from Germany) are both doing equine study courses at Irish schools. We’re also joined by Andrew and Sarah, Five Oaks regulars, and Rachel, who works in the stables. We head through the woods, originally an ancient oak forest, but now mainly pine trees, and Gerry gradually steps up the pace from a trot to a canter. The sun-dappled light turns the trail golden, and the air fills with the sound of drumming hooves. It’s been awhile since I’ve been out on horseback, and I’ve forgotten just how exhilarating an experience it is, with the wind whipping by as the horses stretch their legs into a gallop. The smell of horse-flesh. Leather tack and pine needles blend together, intensifying the adrenaline. It makes me wonder why we ever abandoned the horse for the automobile. About half a mile from Beleek town, we turn the horses and ride back along the trail for home with the two dogs from the ranch — they’ve followed us all the way, making a posse at the rear. The springtime sun is warm on our backs and the trees around us are full of bird song. One of the delights of the Knather Woods trail is the fact that the landscape is entirely rural, and you don’t have to cross main roads or meet any car traffic at all. Gerry, who looks every inch the laconic Western sheriff in denim dudes and Stetson hat was, in fact, a police-man in Ballyshannon for most of his working life. But he also had a show-jumping background, and always had horses. 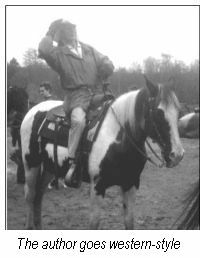 In 1996, on a visit to horse-trainer David Deptford’s stables in Cambridgeshire, England, he rode an American Quarter Horse for the first time. He was totally bowled over by the breed. “I thought, ‘This is it!’ I was in heaven," he recalls. These horses were different from any he’d encountered before. “A typical Western Quarter horse is what we would class in Ireland as somewhere between a pony and a full-grown horse," he explains. “They are a stocky build, with lighter bones and easier to handle -- very adaptable, docile and intelligent. It’s a great horse to ride." 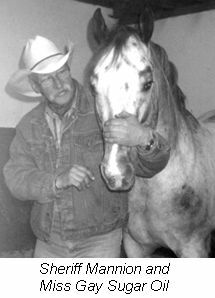 In 1997, Garry and Jackie imported their first Quarter Horse from Texas and established their own breeding program at Five Oaks Ranch. Since then, they’ve produced 14 of the pure breed. Their top stallion, Mr. Colonel Doc, has some of the best bloodlines in the world in the Quarter Horse pedigree. Another horse, Miss Gay Sugar Oil, a palomino mare, is a European champion in cattle-cutting, a herding-type sport in rodeos. Gerry and Jackie are chairman and secretary of the Irish Quarter Horse Association, and Gerry is also the International Director For Ireland to the American Quarter Horse Association. Their passion for the Western horse has taken them all over the American West. They’ve attended the American Quarter Horse Show in Oklahoma, the National Rodeo Finals in Las Vegas and traveled to Arizona, California, Nevada, New Mexico and Texas making contacts in the business. One of the Mannion’s main goals with their ranch is to spread the word about the joys of Western-style riding (although the number of pure-bred Quarter Horses in Ireland is still small). The Quarter Horse Association organizes several Trail Rides using the breed around the country each year. The largest of these, attracting up to 60 riders, is the Break For the Border Trail Ride, hosted annually by Five Oaks Ranch on the last Sunday in August. The ride makes a round-trip from the ranch to Beleek, in County Fermanagh, Northern Ireland, and then returns to Five Oaks. Back on the Ranch, riders enjoy a barbeque and a great evening of live music, attracting several hundred people. Five Oaks Ranch offers everything from basic tuition to one hour trails to weekly packages. On a weekly visit, most people stay in nearby Ballyshannon, a lovely old town situated on the Erne Estuary. There are a variety of rides to take on beaches and other trails in the area. In a horse-mad country like Ireland, it can only be a matter of time before the Quarter Horse becomes a common sight on riding trails. The Mannions are almost certainly the leaders in popularizing a breed that Garford Wilkinson of the American Quarter Horse Association once called “The best all-round horse that ever stood outdoors"
THE AMERICAN QUARTER HORSE: American Quarter Horse stock originated from Arab, Barb and Turk breeds shipped to the Americas by Spanish traders and explorers. Selected horses from these herds were crossed with stock that came from Ireland and England in the early seventeenth century. The cross produced a compact, muscular horse, capable of doing a long day’s work on the range with a heavy saddle and a full-grown man on his back. In the 1800’s, the breed became known as the greatest cattle round-up and trail-driving horse ever. But it could also run a quarter mile distance faster than any other horse. This talent made the breed popular as a weekend match racing horse and earned him his name: “The Celebrated Quarter Mile Running Horse." For further information, contact Gerry and Jackie Mannion, Five Oaks Ranch, Knather, Ballyshannon, Co. Donegal. Tel: 011 353 71 9851030.